January 17, 2019 (Source) — Noble Mineral Exploration Inc. (“Noble” or the “Company”) (TSX-V:NOB, FRANKFURT: NB7, OTC.PK:NLPXF) advises that the Ontario Securities Commission has revoked the cease trade order (the “CTO”) issued against the Company as a result of the delay in the filing of the Company’s audited annual financial statements for the year ended August 31, 2018, and related filings (together, the “Financial Filings”). The Financial Filings were filed by the Company on January 16, 2019 (see the news release issued on January 16, 2019). As a result of the CTO, the TSX Venture Exchange (the “Exchange”) suspended trading in the Company’s securities effective January 7, 2019. The Company has applied to the Exchange for the reinstatement of trading of its common shares. Noble Mineral Exploration Inc. is a Canadian-based junior exploration company which, in addition to its shareholdings in MacDonald Mines Exploration Ltd. and its interest in the Holdsworth gold exploration property in the area of Wawa, Ontario, holds in excess of 70,641 hectares of mineral rights in the Timmins – Cochrane areas of Northern Ontario known as Project 81. Project 81 hosts diversified drill-ready gold and base metal exploration targets at various stages of exploration. More detailed information is available on the website at www.noblemineralexploration.com. 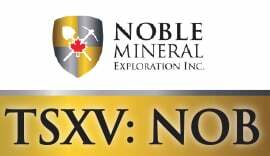 Noble’s common shares trade on the TSX Venture Exchange under the symbol “NOB”. This news release has been authorized by Robert Suttie, the Company’s Chief Financial Officer, and by its audit committee.